Home » Information Professionals » Librarian, Library and Catalog Tweets Revealed! I thought you might like to know yesterday at the request of one of our librarians, I added a link to his twitter account on our library’s staff information page. Nothing big there of course… But then I decided that just the link was a big boring… So, I took a look at the API for twitter, and using it I then embedded the librarians twitter feed into the page. A funny thing happened when I embedded the feed, other staff members felt left out, and a bunch (including myself) went and signed up for their own twitter accounts. Encouraged by their enthusiasm, I began to think a bit more. I then went out and created a twitter feed for the library itself. Now that we had a feed, I needed to tweet. Once that was working, I brain stormed some more, and decided to link twitter to our wordpress blog, a simple process. From there I tied it into our room scheduling program, so that now a tweet is automatically posted when a Library instruction is coming up. After that, I decided it needed something a bit more, and now every night at closing the library will automatically tweet about how much paper was used in our electronic research area. (I modified it a bit so it will now mention how many miles of paper were consumed too…) I hope that in the weeks to come I will be able to add on some more automated tweets. This is ingenious – especially the automated part that sends message to the library’s Twitter account! What else could be automated? 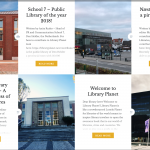 Links to new blog posts for all the library blogs? Notifications for new posts to Flickr? What would you add? During the wait for all the updates to download, I added another twitter feature. 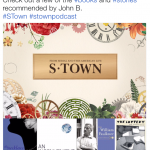 There is now a “Tweet This!” feature on each record in our online catalog. Click the link, and it presents you with a login box for twitter, fill in your username and password, and click “tweet” and the current item you are viewing is automatically tweeted complete with short url to link to the catalog record. I can personally see this working well for a reading list, or even a quick and dirty method for making a list of items for a bibliography. Thanks for writing John! Keep us informed when you update or add new innovations! Take a look at the sidebar below for Marley & Me for the “Tweeet This” link. That is *awesome*! I didn’t know you could trick out SIRSI like that. Way to go, John! To be fair, we are not using the iBistro/iLink (iBlink) catalog, but rather the Web2 catalog, which offers much easier customization. I have been assured though that things of this nature are possible with iBlink. This is inspiring, thank you! Wow, cool! Stuff like this makes me think I should go back to school – again – and learn more computer “stuff.” I know enough to get in trouble, but not enough to really fuss with APIs – and for some reason, I don’t think our consortium would help me do this…. Very cool, very inspiring! Wow, this is very cool. I’m working on an in-house presentation on libraries and twitter, so this is just amazingly timely. Thanks for sharing with all of us. I’m off to twitter to start following John and the gang at Waubonsee C.C. Cool features. I do the same thing with Polaris. Instead of “just checked-out” I have it feed whenever something new hits the shelves. People start asking for the new thing from twitter before it hits the physical shelf.